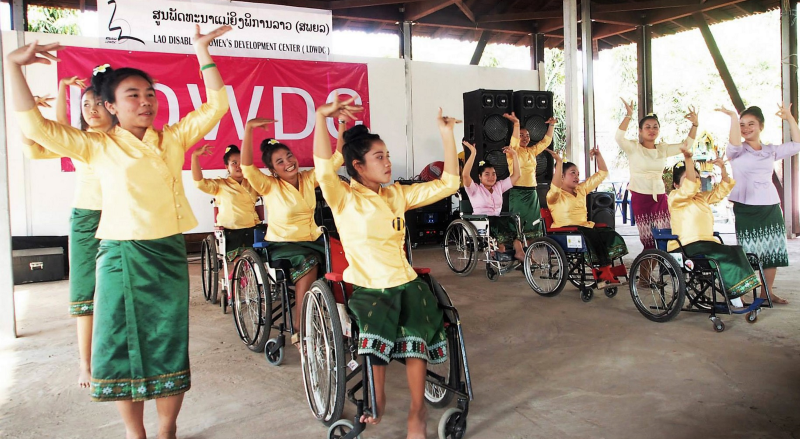 The Lao Disabled Women’s Development Centre (LDWDC) is an active advocate for the rights to recognition and equal opportunities for disabled women. From their earliest days, they have addressed the struggles of women with disabilities to access rights such as education, professional training and employment. Persons with disabilities face multiple barriers when seeking access to such rights, which is often due to social stigma and the lack of inclusive practices from employers. Throughout its history, the centre has provided housing and training to over 900 women from across Laos, thus becoming one of the most prominent voices for disabled people in Lao society. They are not only an organisation for disabled women, but also run by disabled women: out of 30 staff members, 28 are disabled women and most were once beneficiaries of the centre. They create practical opportunities for women with disabilities through vocational and life skills training, education and subsequent employment. Empowering beneficiaries and cultivating their abilities, the centre creates an environment of peer support and emancipation. This TIE project will help them create an advocacy strategy that will strengthen the core of their mission, to go along with a fundraising strategy that will keep them afloat in the coming years. Emma Ryan from Octopus Property is going on TIE in 2019 to work with LDWDC. You can learn more about her here.